Looking for cheap accommodation in Hanoi is not too difficult. Old Quarter filled with a variety of hotels, which are usually for the middle class and backpacker. 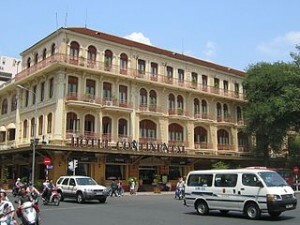 When compared to the quality, lodging in Hanoi tend to be cheaper than in most major cities in Southeast Asia. Like the shape of the house in the Old Quarter, the front of the lodging here is narrow and extends backward and upward. Although from the front it looks ordinary, but most of the rooms are pretty clean, nice, and laid out with enough exotic style. There are many places to stay options and do not worry about running out. Here are some recommendations for cheap lodging in the area of Old Quarter. Hostel with a rental rate of U.S. $ 6 per this evening is located at 48 Ngo Huyen Pho Hoan Kiem. For those of you who do not go alone or with a stranger sleeping problems, this one can be used as a lodging option. Hanoi Backpacker Hostel provides more than 80 beds in a dorm room shaped, equipped with air conditioning. They serve jug for a family room with a very cheap price. You do not want to get out of the hotel at night? On the roof is almost always held a party every night. In addition to the main lodge which is located at Pho Ngo Huyen. Hanoi Backpacker Hotel also recently opened a branch in Pho Ma May and in Hue City. Not far from Hanoi Backpacker Hostel is located exactly in Cau Go Street and Hang Be Street, Hanoi Cozy Hotel there that offer cheap room rent ranging from USD20 per night. The hotel’s location is very close to the lake and the water puppet theater. Although the rooms are not too big, but clean with a private bathroom equipped with hot water.Services staff is also very nice and friendly. They can arrange your sightseeing tour to several attractions, such to the Perfume Pagoda or to Halong Bay. This Hotel is located at 18 Cua Dong Street offering room rental rates start from USD20 per night. Spacious rooms are not too big, but have a private bathroom with hot water. The staff is very friendly and professional, strategic location, free wifi available, and provided free breakfast. Ordering is also free tea and coffee all day. Most of the photos and images obtained from wikimedia commons and private collections according to the license specified in regulations. If you need ask, request, review, and anything about this site please contact us.